How do I make a SkyDrive album public? 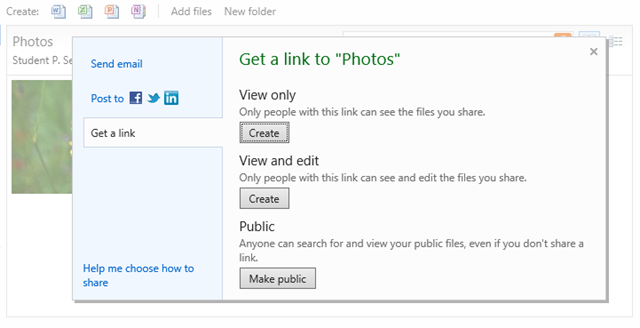 When you wish to allow access to a SkyDrive photo album to everyone and anyone on the Internet the share setting needs to be set to Everyone. When you create a new folder of album the sharing will be set to “This folder is not shared”. To share the folder click the Share folder link. This brings up a dialog where you can specify email addresses and other specific ways to share. To make the album public click Get a link. This next dialog has a Make public button. Click the Make public button. The folder is now public. You will see a text box with a length URL. You can copy this web address and share it with your friends. There is also a Shorten button. Clicking that provides you with a shorter web address. The information pane will now show that the folder is shared with Everyone. There is an X to the right of this setting, the normal “delete” icon. Click that to remove the permission. 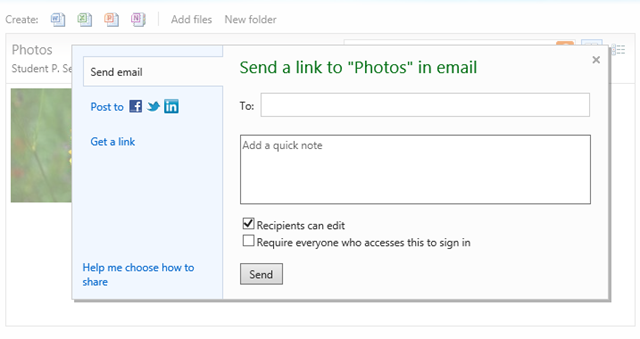 You can use the web address in emails to your friends or in blog posts and wherever you wish to provide a link to your SkyDrive photo album. Viewers do not need to sign in to see public albums.